AKA Allen Sapp Gallery Art Gallery of Regina Dunlop Art Gallery Estevan Art Gallery & Museum Godfrey Dean Art Gallery MANN Art Gallery Moose Jaw Museum & Art Gallery PAVED Arts Sâkêwêwak First Nations Artists' Collective Inc.
Ruth Cuthand was curated by Dunlop Art Gallery and exhibited in Cumberland House. I was born in 1954 in Prince Albert, Saskatchewan, of Plains Cree, Scottish and Irish ancestry. I grew up in Cardston Alberta near the Blood Reserve, where at the age of eight I met artist Gerald Tailfeathers and decided that I, too, wanted to be an artist. As a child, my first art materials included the orange paper that was discarded in the processing of the Polaroid chest x-rays that we were subjected to annually as students in routine tuberculosis screenings; they collected the peculiar-smelling 18-inch squares of paper and gave them to my Anglican minister father for use in Sunday school. Early fascination with disease, First Nations living conditions, and settler/Native relationships informed by childhood experiences have become key elements in my creative practice, which has encompassed printmaking, painting, drawing, photography, and beadwork. 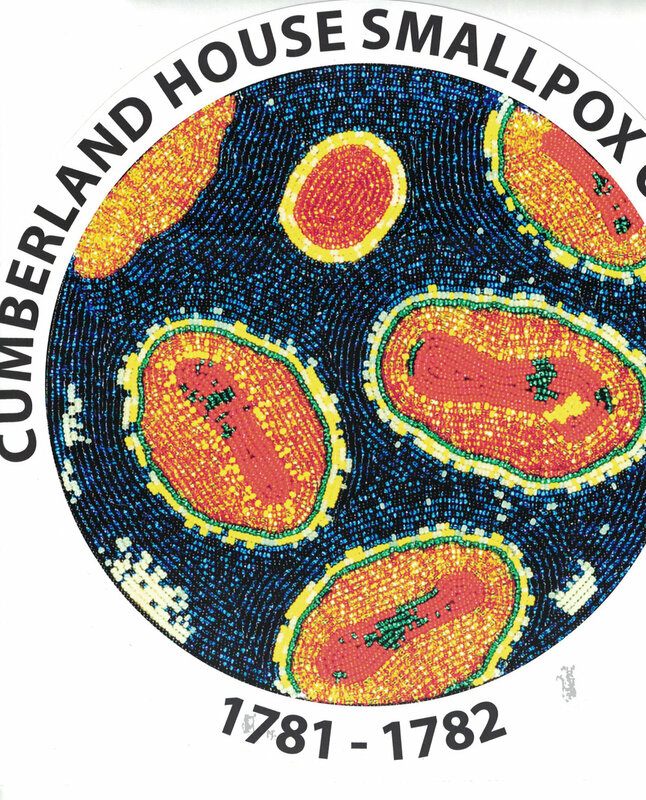 Cumberland House had the first outbreak of smallpox in the West of Canada. What was interesting about this was the way the HBC factor, William Tomison and Matthew Cocking reacted to the outbreak. Both having come from the Orkney Islands in northern Scotland, had been exposed to smallpox as young children. They knew that people with the disease must be quarantined, nursed and fed. They took the sick into the Hudson Bay quarters and dug graves for the dead in the frozen ground of February. Tomison and Cocking kept journals of the epidemic, which was the first records of an epidemic among Indigenous people. I have been working on the health impact of colonization on Indigenous people. I have beaded disease that came from the old world to the new world, boil water advisories and other health outcomes. My interest in the spread of disease informs my project with the town of Cumberland House. I have an 18” static window cling and 300 smaller ones, with the image of smallpox from my Trading series. I will explain my research at the school, put the larger window cling on the window. I will hand out the smaller window clings to the students and they will stick them on the windows of their homes. This will take place on June 11th, before students are let out for the summer. I will photograph the windows. I will also find someone in the community, who can photograph the community’s windows. As Cumberland House is in the north of Saskatchewan, I will send a window cling and smaller ones to the Dunlop.